Tarsal Tunnel Syndrome, and Trochanteric Bursitis. Physiologic and training effects of deep water running for athletes. For more information about Dr. Wilder’s publications, interests, and textbooks, please click on the links below. 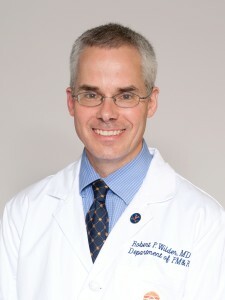 Robert Wilder, MD, is chair of the Department of Physical Medicine and Rehabilitation at UVA. He also serves as medical director of The Runner’s Clinic and the UVA SPEED Clinic, and directs the Primary Care Sports Medicine Fellowship Program. Born in California, Dr. Wilder attended the University of Dayton for his undergraduate degree and earned his MD from UVA. He then moved on to Baylor College of Medicine in Houston, Texas, for his residency in physical medicine and rehabilitation, followed by a fellowship in primary care sports medicine at the Virginia Sports Medicine Institute in Arlington. He joined UVA in 1998, and became a professor in 2015. He has chaired the Department of Physical Medicine and Rehabilitation since 2010. In addition to his work at UVA, Dr. Wilder is the head team physician for Ragged Mountain Racing and Monticello High School, a USTA Tournament physician and the medical director for numerous local races, including the Charlottesville Marathon and Half-Marathon, the Charlottesville Ten Miler and the Women’s Four Miler.